LIKE HER PRACTICE, Charline von Heyl’s studio is split in two: One room is for painting and the other for works on paper. In this second room, by the door that leads to the other side, is a large-format Epson ink-jet printer, one of the many machines the artist has enlisted in her recent experiments with printmaking and collage. Although she is known primarily as a painter, von Heyl has been spending more and more time devising unexpected encounters between digital reproduction and archaic precursors such as hand-carved woodcuts, stencils, lithographs, and screenprints. Paper functions as a carrier for many techniques, each layered on top of the other in unorthodox sequences and mixtures. As relentlessly abstract as her canvases, von Heyl’s works on paper are like travel posters for unpicturable, exploded destinations; they are pages of chaos. Sabotage, a book to be published next month by Xn Éditions and Christophe Daviet-Thery, in a limited edition of three hundred, is the latest project to emerge from the nonpainting side of von Heyl’s studio. Rejecting both written language and illustration, Sabotage is a sort of image-text that gets straight to one of the book format’s most abstract possibilities: the material production of a sort of counterspace that exists beyond meaning. Interspersing transparent (Mylar) and opaque (paper) pagesa selection of the latter have been reconceived for publication hereSabotage exploits the optical effects of superimposition while riveting the attention of its reader to the basic activity of turning pages. Isn’t this every book’s most intimate desireto be ransacked and explored by fingers and eyes? Each turned page makes and unmakes the next, and the book remains in a state of constant optical transformation. Stéphane Mallarmé, too, was fascinated by the fact that a book is above all an optical devicehe even addressed the way a volume poses in the glamorous space of a shopwindow. With Sabotage, von Heyl invents something strange and ultimately unknowable with the purely material and energetic qualities of the book: surface and movement, ink and action. She lures the viewer into a readerly relation with her two-sided images. Frequently appropriating fragments of vintage comic books, found photographs, and other ready-made visuals, von Heyl layers and attacks these in such a way that they lose any illustrative function. Sabotage thus pursues a notion of abstraction as a process that resists representation, but that is also cunning and ironic enough to be able to picture itselframpantly quoting aesthetic histories and styles, striking poses on the page. It is formalism exploiting its own power to leap from one content to another, reprogramming the book as a machine for producing surfaces. 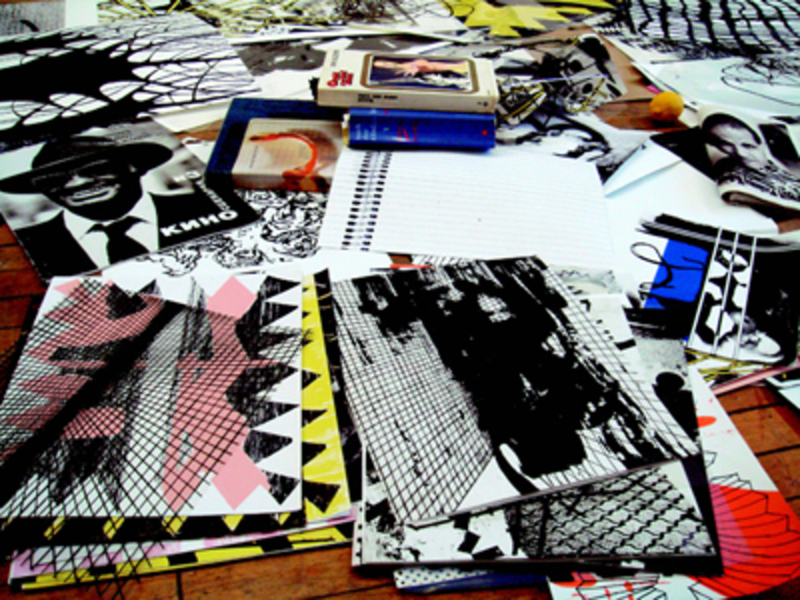 Interior of Charline von Heyl’s studio, New York, 2008. Photo: Charline von Heyl. THE BOOK IS CALLED SABOTAGE for several reasons. I like that it is the same word in several languages, and that it is, like desire, a generic, overused nonword that almost works like an image but actually stands for something simple and raw. It is also what I’m doing in my own work, always sabotaging my own concepts and approaches, my own linear advancement, my own visual expectations.